Ripple is both a digital currency like Bitcoin, Ethereum, Litecoin and is also an open payment network which facilitates the transactions. Unlike most cryptocurrencies which aim to decentralise the banking system, Ripple is the only working digital asset actively working with banks to improve rather than undermine their operations. Ripple boasts the ability to process on average over 1,500 transactions per second, making it the fastest cryptocurrency on the market. Imagine you want to send money to your friend, who lives in Korea. Usually, you will have to do this at a bank, which will have to go through a few intermediaries, wasting time and increasing the risk. With Ripple working with banks, it allows your cross-border payment to be done within 5 to 10 seconds. 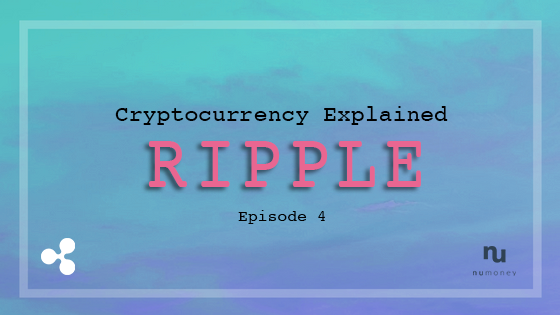 Back in 2004, Ripplepay was launched as a peer-to-peer payment system by Ryan Fugger, which serves as a financial service to provide secure payment options to members of an online community via a global network. Chris Larsen and Jed McCaleb took over the reins from Fugger and this led to the conception of a new system, developing digital currency system which transactions are verified by consensus among members of the network, unlike Bitcoin which relies on blockchain ledgers, co-founding the corporation OpenCoin. Later in 2013, OpenCoin changed its name to Ripple Labs and it releases its source code for peer-to-peer node behind Ripple payment network. This meant that the community had the required tools needed to maintain Ripple network on its own. It was later rebranded to Ripple which you currently know of. Subsequently, more and more banks integrated Ripple into their payment system, with American Express (AMEX) as one of them. Incredible scalability: Can sustain 1,500 fully settled transactions per second, which is way more than any other published benchmarks for blockchain like technology and this is just a fraction of its potential. Payment Speed: It settles payment within five to ten seconds compared to two minutes plus with Ethereum and one hour plus for Bitcoin. It sets Ripple a significant advantage over the other cryptocurrencies with its speed. And just for extra information, traditional banking systems take around three to five days. Long-Term Stability: Ripple has a five-year track record of stable technology and governance maintained by a dedicated team of world-class engineers. As banks are unlikely to adopt/invest in technology that they plan to abandon after a year or two, when more financial services use Ripple, it shows the trust of banks in them. Centralised: The supply of XRP is controlled by the company who currently owns more than 60% of all existing XRP coins. Due to the fact that coins were not mined and the majority of them are still in control by Ripple makes people feel that Ripple is controlling the blockchain and thus, a scam. Limited expansion: Ripple has been concentrating on targeting banks exclusively which is quite a turn-off for many early adopters of blockchain technology. This is also one of the reasons Jed McCaleb left Ripple in 2013 and forked out another cryptocurrency, Stellar. Openness: The openness which Ripple network operates has allowed for vulnerabilities to develop. Although the core of the network remains highly liquid, the structure also allows for attacks on certain nodes within the network. This might put at least 50,000 wallets to be at risk if such an attack were to occur. But this might be actually a good thing as this allows other to help identify the weaknesses such that Ripple’s developers may be able to correct them. There you have it, Ripple explained in under 5mins. As always, before deciding to invest in anything, do research more before finalising your decision.